The Total War series has left a legacy as one of the most distinguished and highly praised strategy games of all time. For over a decade, the series allowed strategists to control the mighty nations of eras past and build an empire across the world through governance, diplomacy, and conquest. As well as managing your nation’s finances, foreign affairs, and infrastructure, you’d meet your rivals on the battlefield with thousands of soldiers brutally decimating each other while you utilize cunning tactics to gain the upper hand and emerge victorious. The Total War series has guided the player through classic antiquity, the medieval era, the colonial age, the rise and downfall of the Samurai, and now for the first time ever, the Total War series has merged with one of the biggest tabletop wargame franchises in the world: Warhammer — a dark twisted fantasy universe, where the only form of existence is ceaseless conquest. Now you’ll take charge of many famed Warhammer factions including the Empire, the Greenskins, the Vampire Counts, the Dwarves, and the forces of Chaos to build your own Warhammer legend as Emperor of the Warhammer universe. The gameplay follows the formula of previous Total War games, in particular Rome 2 and Attila. For the campaign, you choose one of the available factions of Warhammer — each with their own attributes, characteristics, and even their own story to follow. From there you’re introduced to a faction introduction video detailing the situation and what must be done to achieve dominance over your rivals. Soon enough you’ll be on the grand campaign map and those familiar with the Total War series will know what to expect. Your chosen faction begins with a single settlement, a faction leader and troops to command. You’re surrounded by rival factions who would like nothing better than to burn your settlement to the ground. You can develop improvements to your settlements to train better troops, feed the population and produce income to develop a wealthy nation. Further developments are unlocked through research where you can discover more efficient ways to produce income, feed the populace, and produce better troops to command. You can hire lords to govern settlements and lead armies — each bringing certain bonuses and even negatives to your faction. They can be assigned administrative positions with your government, enabling them to manage the economy, agriculture, or industry of your empire. You can also hire heroes to join your ranks who carry bonuses with them and strengthen the morale of your army. Heroes can be sent to enemy settlements to sabotage buildings, assault enemy soldiers and assassinate faction leaders. Lords and faction leaders can level up as they govern while heroes level up as they complete more missions. You’re also given quests to carry out and completing them reaps great rewards such as gold or new weapons and armor for your hero, lord or leader. They can gain skills which enforce more public order, inspire troops or increase renown throughout the land. All this in unison will have you making tough decisions in regards to managing your empire and as armies from all corners of the Old World draw closer to your gates together with the alluring yet corrupting powers of Chaos slithering through your domain, you’d better come up with those decisions fast. As the name implies, Total War is nigh and in Total War: Warhammer, war is presented on a gargantuan scale. Total War has gone from using history as a foundation for its setting to the realm of fantasy. 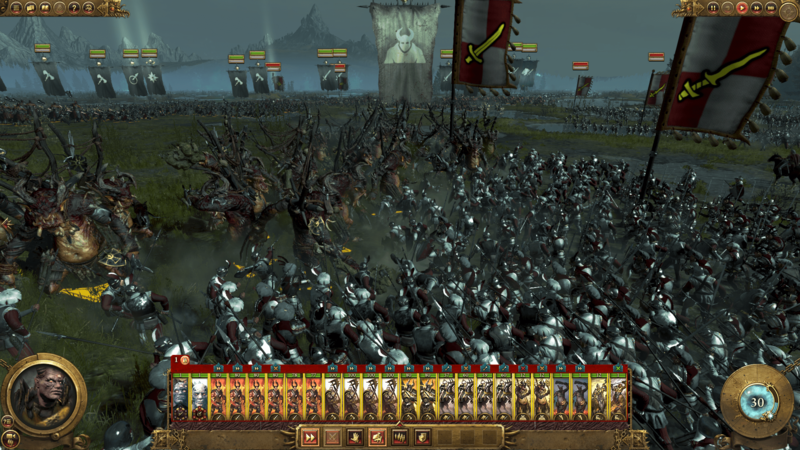 The scope of the battle is remarkable, with thousands of men, Dwarfs, Greenskins, undead, and the forces of Chaos locked in battle hacking and bashing and smashing their way through each other. The battles have you on the edge of your seat and you charge your soldiers forward while thinking up ingenious tactics to drive your enemies to the abyss. Siege battles add a sense of tension and dread as you struggle to send your siege equipment to the enemy’s walls with your opponents trying to prevent you from reaching them. Battle AI has improved significantly this time around as units actually stay in formation or make tactical retreats when necessary. Naval battles are absent in Total War: Warhammer, replaced instead with battles in subterranean underground lairs where only the Greenskins and Dwarfs can enter and conquer. Swordsmen, cavalry, and artillery are at your command, as well as special units from each faction including the Vampire Count’s Terrorgheists, the Empire’s Steam Tank, the Dwarves’ Gyrocopters, and many more. Magic now plays a major part in battles when heroes and leaders join your ranks. You can cast spells during battle which improve your soldiers’ defenses or unleash devastation on the enemy. Be careful as you can only cast a certain number of spells each battle depending on your magic reserves. Heroes, Lords, and leaders who fight alongside your men will level up the more they fight and you can acquire improved skills for their next battle. Flying units like Gyrocopters and the Pegasus Knights also change how battles are played out as units must watch the skies for danger. The terrain of the map allows tactical advantages, such as high ground offering better defense and accurate missile fire and woodlands concealing your units for surprise attacks. The means to crush your enemies of the Old World in your grasp will truly earn you your right to rule as you emerge victorious battle after battle after battle. Total War: Warhammer looks completely astounding. The detail, the effects, the environments and the character models. Everything in this game looks pristine. The Total War series has delivered glorious visuals and this looks especially impressive. Sound is also a winner here with top-notch voice acting, frightening and thrilling clash of battle sounds, thunderous spells and siege weapons all encompassed in a breathtaking and powerful musical soundtrack. The Warhammer universe has surely come to life with visuals and sound worthy of a blockbuster fantasy war movie. There will be many battles awaiting you in the Old World. Play the campaign again with a different faction, making new choices to advance your new empire. Setup custom battles fighting on land, in underground hallways, or in sieges against colossal settlements. Engage in massive battles online or play on the campaign map with your friends. 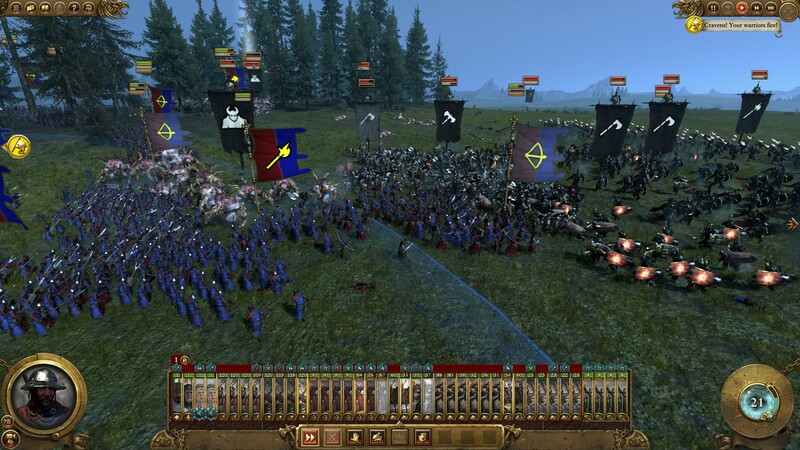 Play out exciting quest battles which offer rewards like new weapons and armor, also the game has mod support through the Steam Workshop and those who are familiar with the work of the Total War modding community will expect some very special content from them in the near future. Total War: Warhammer is yet another winning chapter in both the Total War series and the Warhammer franchise. Total War: Warhammer provides fans of both franchises an epic fantasy scenario with strategic, comprehensive and fun gameplay. There are a few flaws with this game however that some Total War fans may notice when this is paired with other Total War games. The battles have become rather simplified, since those sophisticated and clever formations that you can order your troops to form are gone. Instead you only have two formations which is setting missile units or melee units to the front. While this makes getting into fights much faster, this also makes managing your troops rather cumbersome since you won’t be able to position cavalry, spear-men, artillery and even special units how you’d like fast enough. Also missing are the choreographed duels between fighters in battles which were fun to watch before but are unfortunately absent now. For now at least there aren’t any naval battles, which is a shame because using Dwarven Dreadnoughts or Imperial Wolfships to bring your foes down to the depths of the ocean would have been absolute joy. The Skaven are missing from this game also and they would have made a very fun and interesting faction to play as. There doesn’t appear to be a tutorial for the game. Instead, there is an introductory segment of the grand campaign at the beginning which teaches you how to interact with battles and the campaign map. 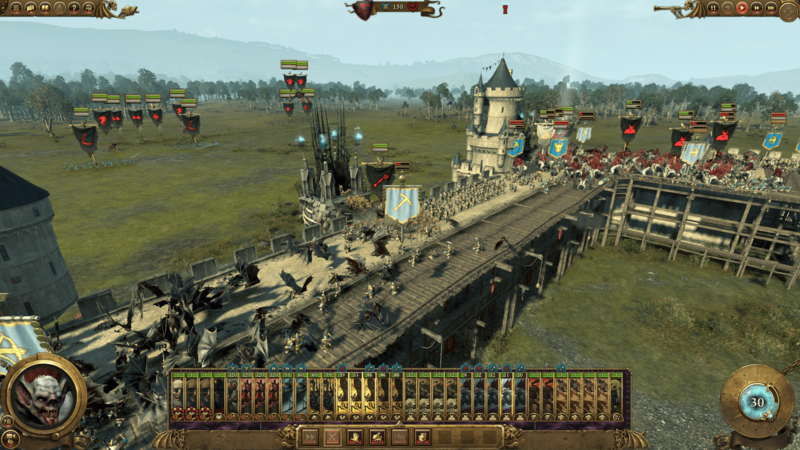 Total War: Warhammer assumes that those playing this game have also played earlier Total War games, so newcomers to the series may be put off from the lack of guidance and steep learning curve. Developers Creative Assembly and publishers Sega pull off yet another cinematic, exciting and epic-scale strategy gaming experience. It’s as if the thrilling and in-depth strategy gameplay of Total War and the deep exciting lore of Warhammer were meant for each other. What started as a tabletop board game has become the ultimate backdrop to wage war in a dark, gritty fantasy universe. Battle, conquest, and colonization are what make Total War so exciting and now you’ll be able to do those things against some of the most well-known and hugely popular factions of the Warhammer franchise. Forge your empire with Total War: Warhammer and take your rightful place as ruler of the Old World. This review was based on a digital review copy of Total War: Warhammer for Windows provided by SEGA. Dawn of War II: Retribution Review: For The Emperor!